The provost guides the strategic academic vision for the university and oversees all academic matters, including hiring new faculty, working with faculty to develop new programs and initiatives, and setting academic policy. APU’s provost, Mark Stanton, Ph.D., ABPP, is also a professor of graduate psychology. 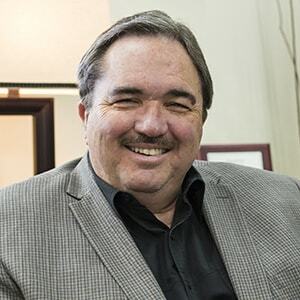 He served previously as founding dean of APU’s School of Behavioral and Applied Sciences (2006-11), chair of the Department of Graduate Psychology (2000-06), and founding director of the APA-accredited Doctor of Psychology (Psy.D.) program (1996-2006). Stanton identifies himself as a couple and family psychologist, adopting an understanding of human behavior that recognizes the importance of individual, interpersonal, and environmental factors. He was the 2011-12 president of the American Board of Couple and Family Psychology, a constituent board of the American Board of Professional Psychology, and the 2005 president of the Society for Family Psychology of the American Psychological Association. He is a licensed psychologist in the state of California and board certified in couple and family psychology with the American Board of Professional Psychology, an internationally recognized postdoctoral board covering specialties in psychology. The Society for Family Psychology recognized him as the Family Psychologist of the Year in 2007. Stanton is the author of more than 50 articles, books, and book chapters on family therapy, the systemic treatment of substance abuse, competencies in couple and family psychotherapy, the epistemology of couple and family psychology, graduate education in family psychology, and personality-guided couple therapy. He was the inaugural editor (2011-14) of Couple & Family Psychology: Research & Practice, a peer-reviewed journal published by APA, and served as editor of The Family Psychologist (2002-07). He is co-author (with Irene and Herbert Goldenberg) of Family Therapy: An Overview (Cengage Learning, 2017) and (with Robert Welsh) of Specialty Competencies in Couple and Family Psychology (Oxford University Press, 2011), as well as co-editor (with James Bray) of The Wiley-Blackwell Handbook of Family Psychology (Wiley-Blackwell, 2009), a 54-chapter comprehensive overview of the specialty of family psychology.